The seven Routemasters acquired in June 2015 by Henry Cooper Coaches are going through a programme of refurbishment, with three already MOT'd and being used on private hire. The seventh vehicle RM 1640 (640 DYE) which didn't travel north with the other six, has finally reached the north east and a start has been made by stripping out all of the seats for a deep clean. The general refurbishment of the others has included fitment of new radiators, new stainless steel exhausts, new hoses and stainless steel water pipes. The undersides have been steam cleaned and painted silver and each vehicle has been individually assessed for any extra work, for example RM1562 has received a new staircase and RM 1218 has had the lower side panels painted as a temporary measure, prior to eventually being re-panelled. Both 1218 and 1562 have had new tyres and all vehicles dealt with have had oil changes. Graham Greaves, owner of Henry Cooper Coaches is a great fan of the RM. According to Graham “They are a little bit of our history. There won't be any more coming along so I'm prepared to invest in them in order to give them the best chance of survival” He's particularly enthusiastic about RM1562 which has a Cummins ISB engine and is therefore quite sprightly compared to the others. He plans to keep this vehicle to run alongside RM931 (MFF 580) which has been part of his fleet for some years now. The long term plan is to eventually sell the remaining vehicles but he's in no rush to do so. On 29th August Graham has work for three of them and there's tremendous interest from potential customers, with daily phone enquiries, especially now that two of the vehicles have received eye catching pictures of London scenes on their advertising panels. OK, the adverts might not suit the purists or the rivet counters, but the buses look good and customers who hire them are impressed. When it comes to selling the vehicles the adverts can easily be removed and replaced with appropriate heritage style adverts. And finally...not a Routemaster. This is the number to dial if you fancy treating yourself. 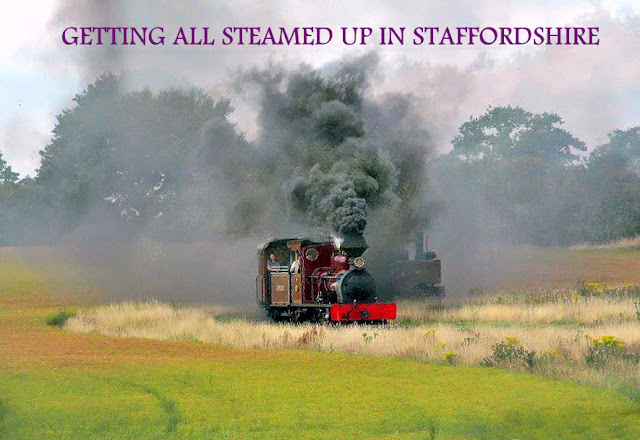 Brain Bell recently visited the excellent Statfold Barn Railway situated near to Tamworth in Staffordshire. The Statfold Barn Railway is a mixed gauge of 4ft 8 1⁄2 ins (1,435 mm) standard gauge, 2ft 6ins (762 mm) narrow gauge and 2ft (610 mm) gauge. It is privately owned by Mr Graham Lee, former chairman of LH Group Services Ltd – which in 2005 bought what remained of the Hunslet Engine Company. The 'Field Railway' is a dual 2ft 6ins (762 mm) gauge and 2ft (610 mm) gauge line approximately 1.5 miles (2.4 km) long with a "balloon loop" at one end with a station at the other end. There is a passing loop halfway along the line which has a single platform 'Oak Tree Halt' and a siding heading off to storage facilities in the 'Grain Store'.